Sycamores are widely used as shade trees in residential yards and along streets in many areas of the United States, as well as in Europe, Asia Minor and China. Perhaps more popular in the urban and suburban environment is the related a d somewhat smaller London Plane tree (Platanus x acerifolia) a hybrid of the American and Oriental Sycamores, appearing in London in 1645. 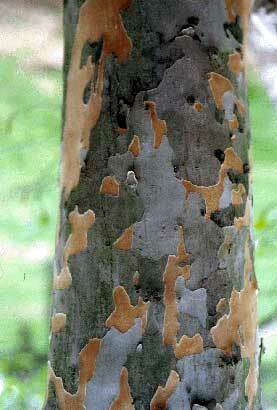 Both trees are easily identified by their multicolored, patchwork bark, caused by regular peeling of portions of it through the seasons, and by the fuzzy ball-like fruits which hang on their branches. Deciduous trees, they lose their very large leaves every fall. The wood of the sycamores is heavy, hard, tough and coarse. Anyone trying to split sycamore slabs for firewood using a wedge and maul, as I have, are likely to add a few more curse words to their vocabulary. Splitting sycamore should be left to the hydraulic splitting machines. On the other hand, its toughness makes it ideal for use in butcher blocks, flooring, and even fine furniture. Sycamores need plenty of space to grow. While they have their share of disease problems and tend to be a bit messy as their bark sheds, they are handsome trees. Sycamores support a variety of wildlife over their lifetime. Birds nest in their generous branches and raise families there year after year. Notably, Cerulean warblers, threatened by loss of habit, depend on old sycamores to be the headquarters of their mating territories. When they get large and old sycamores develop deep cavities where large limbs have were pruned or dropped off. These cozy holes shelter generations of squirrels, bats and the occasional hive of wild honeybees.